Today (Nov 19) is my dad’s birthday. Since my parents divorced when I was three or four, I haven’t really done much for his birthday. A card sent when I was younger, a text or a Facebook message in more recent years. It certainly was never about not caring. In some ways, I really take after him, or at least the side of him I’ve always known: not opening up easily, not sharing emotions very openly. One way I know this is similar to him is because it’s the same thing I’d get on my birthday. But this year is different. This is the first birthday for him that’s come up that he won’t be getting older. The next few weeks are going to be tough for all of these “firsts” without him. When Dad died back in January, to say it was a shock would be an understatement of huge proportions. And to have it happen just a few hours separate from the passing of his mom, my grandma, left an open wound for the whole family. It’s been ten months of healing, but I have no question that wound is about to open wide again. This is the second time I’ve lost a father. My step-dad passed away in 1996, and even to this day there’s still a gap in my life. But while that will never go away, two decades has a way of easing the pain and promoting the good memories instead. But that time hasn’t passed yet, and so I’m just putting some thoughts out there. Today would have been his 65th birthday. I have no doubt there would have been a bit of a to-do, especially with it being on a Saturday. Cake and ice cream, lots of laughter. But that’s not what this year will have in store. I guess I’m just writing this as a little bit of personal therapy. In the weeks to come there will be thanks given among the tears, and gifts under trees that won’t shine quite as bright because of his absence, and that of Grandma. I’ll just leave this a open letter to all my family – to Lori, and ‘Chelle, Stevie, and my step-mom, Sheila. To all my aunts and uncles, and all the (countless!) cousins. Whether you knew him as Dad, uncle, brother, grandpa, it doesn’t matter. The absence is real, and I know it affects us all. In the mid-80s, the glam-band heyday was in full swing. Bands like Mötley Crüe and Bon Jovi were setting the world on fire, filling arenas and flooding the airwaves of MTV. In the middle of all of that came a surprising upstart that shifted perceptions in the music world. “To Hell With The Devil” was released in 1986 and struck gold – then platinum! 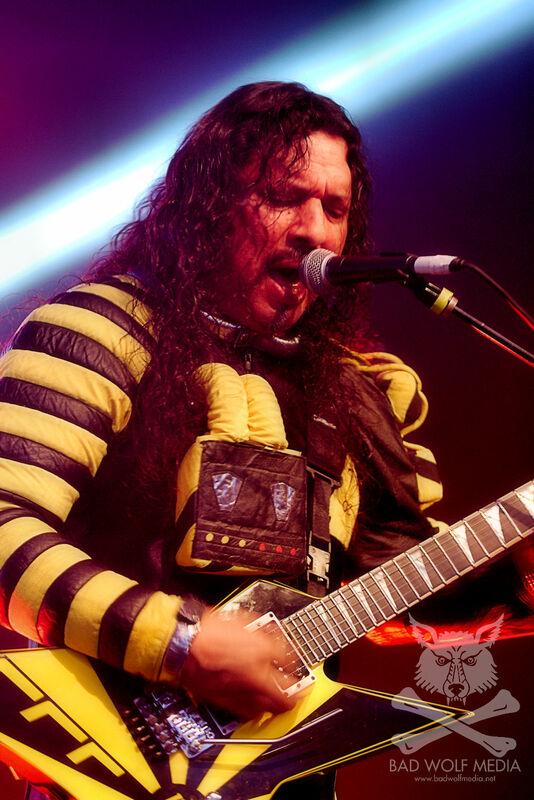 The third album from Christian hard rock band Stryper was the first album by any Christian rock band to reach platinum, and held on to the title of best-selling album in that genre for fifteen years. 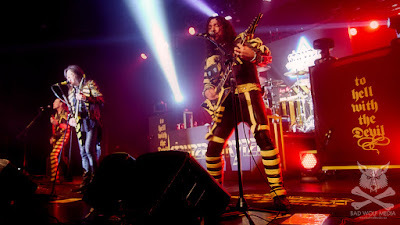 Stryper would find massive success with the broader audiences with their videos for the album playing alongside the likes of Poison, Def Leppard Warrant, Great White, and Tesla – the dominant forces of music in the 80s and 90s. 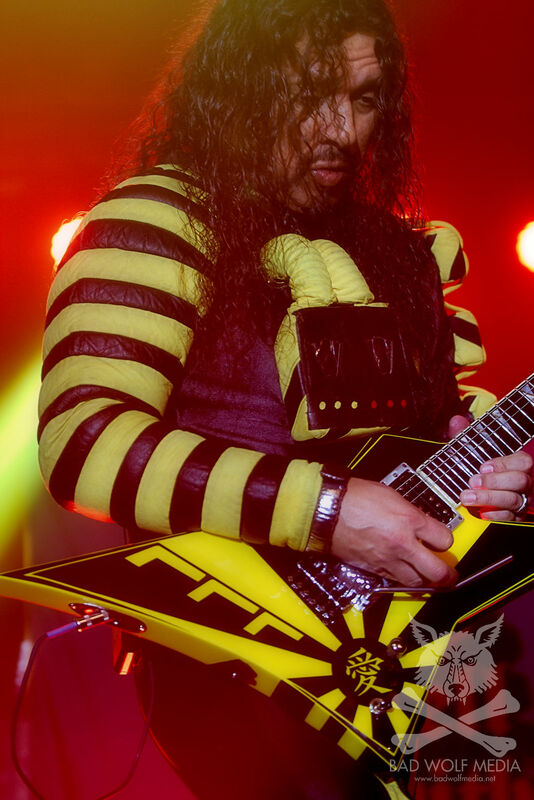 Now, thirty years after that groundbreaking release, Stryper is taking the “THWTD” show back on the road. 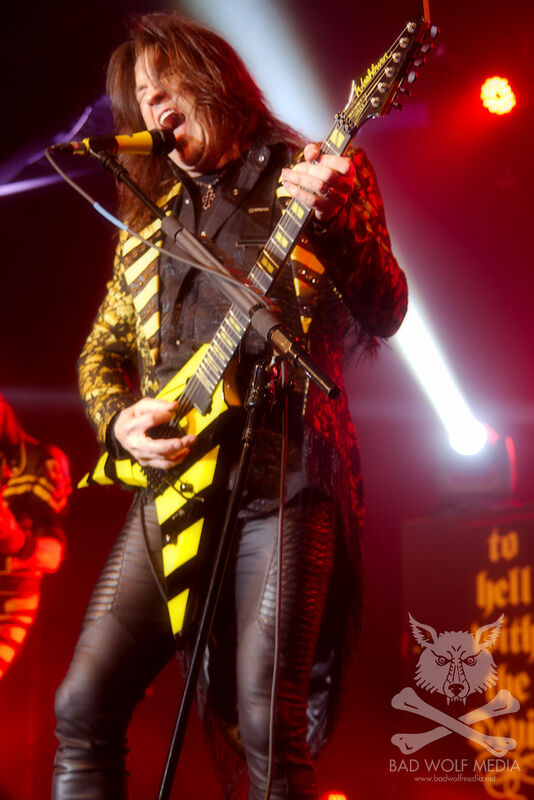 With the original band members wearing the traditional black and yellow and playing the album in its entirety, the 30th Anniversary tour dropped into the Limelight Eventplex in Peoria on November 4th. Even after all this time, this band is a tight unit. Michael Sweet still brings the crowd to a cheering roar with every note. He doesn’t sound exactly the same as he did when the bad was at their MTV-era peak, but in all honesty, that’s not a complaint. He doesn’t sound the same because his voice and skill have continued to mature. His guitar playing is also immaculate, sharing duties with Oz Fox and contributing one half of a two-axe attack that just sounds incredible. Carrying on his standard form of sitting sideways, Robert Sweet drives every song. He plays like a madman, and plays to the crowd like the veteran he is. And with the way he sits, the audience can see just how much effort it is to work behind the tubs. Shredding the six-strings in true 80s hair-metal fashion is Oz Fox, and he hasn’t dropped a single note. He still fills the songs with the screaming sound that you would want to hear, and his stage presence is hugely entertaining. As mentioned, Fox and Sweet don’t have a traditional lead and rhythm relationship. They trade back and forth, and the bring a duality to solos that brings to mind the heyday of KISS, with Stanley and Frehley harmonizing with their six-strings. Timothy Gaines works right along with Robert to make up the rhythm section. His bass still thunders, and his backing vocals blend into a great harmony with both Sweet and Fox. It’s not hard to imagine how different the band might sound with someone else in his spot – it’s happened in the past – but this is the line-up the band should have. 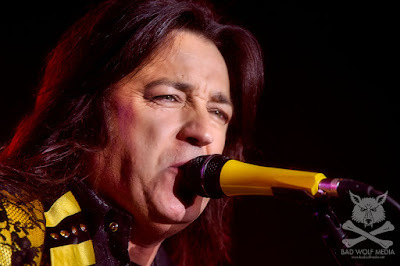 As Michael Sweet stated, some of the songs from “To Hell With The Devil” haven’t been played since that time thirty years ago. But I would challenge anyone to pick them out of the crowd. Songs like “Holding On” and “Rockin’ The World” sound as slick and practiced as “Calling On You” and “Free.” The set list is a touch awkward, because they open with the entire album, in album order. This isn’t always the best flow for live shows, but they make it work, and the nostalgia factor is cranked to eleven. 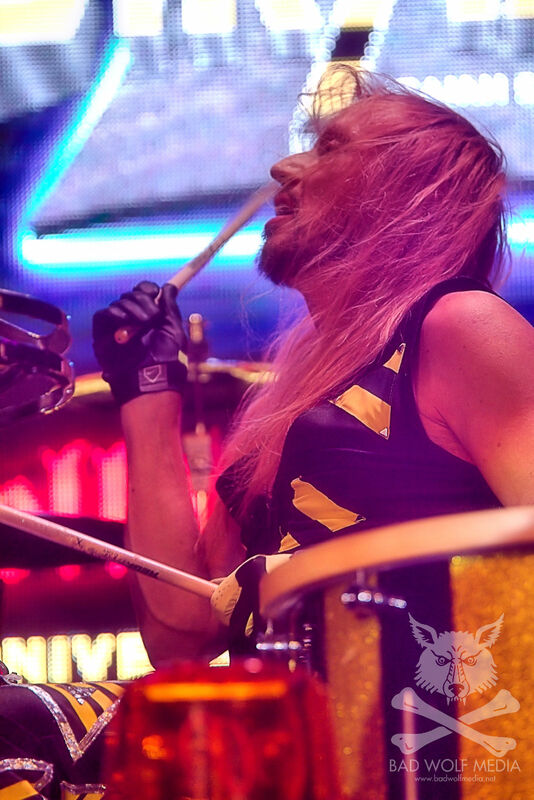 After the album portion of the show, and following a quick costume change which found frontman Sweet sporting a crowd-please Cubs jersey, the band switched up to a more standard set. Newer numbers like “Yahweh” joined classics from other albums like “Soldiers Under Command” and “In God We Trust.” They also pulled a pair of covers – “Shout it Out Loud” and the apropos “Heaven and Hell” – to fill out the set of ten songs on top of the ten from “To Hell With The Devil”. While the venue – Limelight Eventplex in Peoria – is a fair difference from the arenas the band was playing three decades past, the place was packed with screaming, singing-along fans clamoring for the picks and Bibles tossed from the stage. It’s a fantastic facility the likes of which would be welcome down here in the Gem City, and they know how to present a true headlining show. 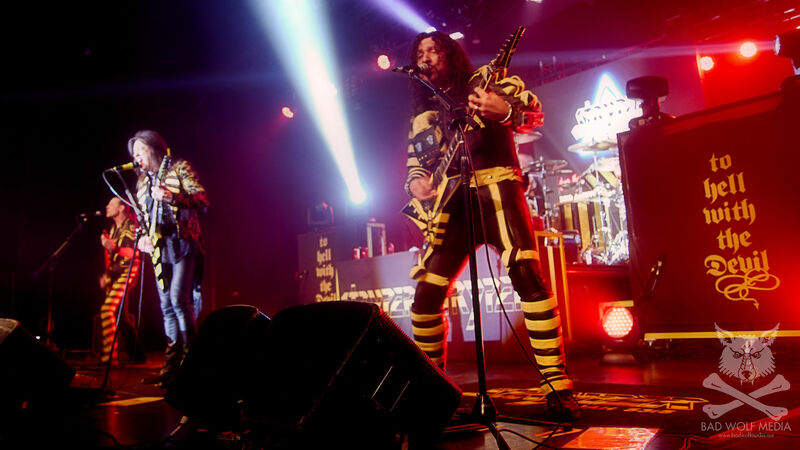 Nearly thirty-three years after they started, and thirty years after they broke through as a major force, Stryper hasn’t pulled any punches. They wear their faith proudly, not as a gimmick, and while they’re happy to share their views, they’re never preachy about it. Whether that’s your thing or not, it doesn’t matter. Lyrics raising praise to the heavens or conjuring darker imagery are both tools of the trade, and neither of them matter if the music isn’t solid. 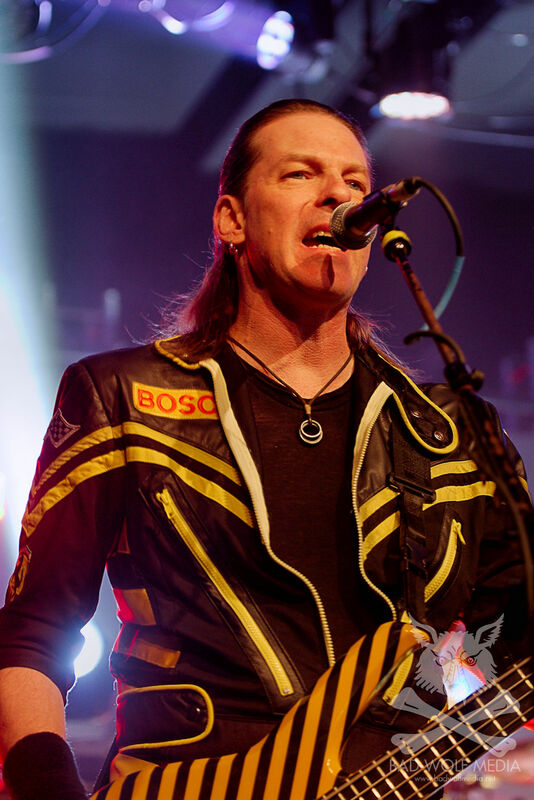 Stryper’s songs bring the former, but they’re rooted in a solid foundation of hard, heavy rock music. Every word of praise, every accolade laid at the feet of this band is well-earned. 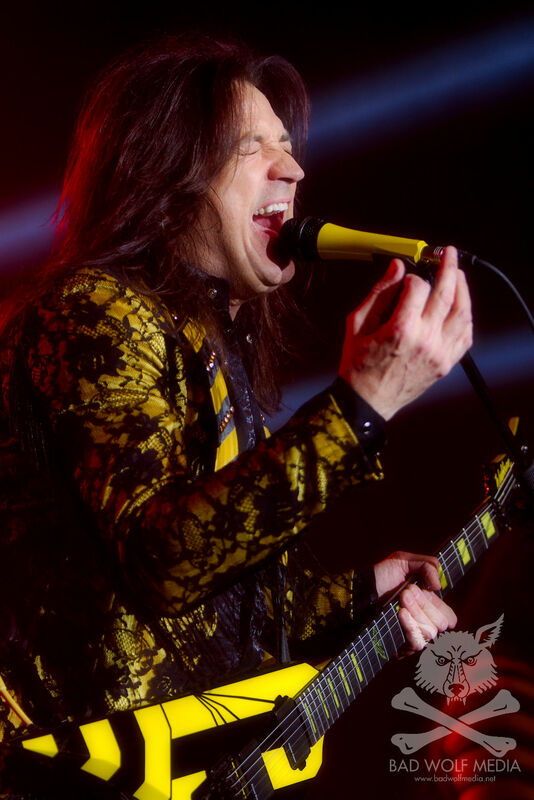 While other bands come and go as flashes in the pan, Stryper has proven that their faith and their talents are still relevant and still hold that stage with grace and humility. It’s been a 30+ year ride, and these guys don’t show any signs of hitting the brakes.